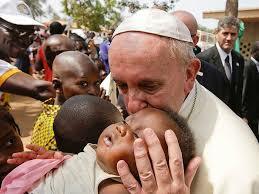 After the Regina Coeli, Pope Francis invited everyone to pray for the people of the Central African Republic. In his message on Sunday, Pope Francis noted that the Central African Republic has in recent days experienced “serious violence” that has seen 25 more people killed when a church was attacked earlier this week in Bangui, with almost 100 people were wounded. “May the Lord, through the intercession of the Virgin Mary, help everyone to say ‘no’ to violence, in order to build peace together,” the Pope prayed. The Holy Father was also particularly saddened by the recent attack on St Ignatius Catholic Parish, Mbalom in Gwer West, Local Government Council of Benue state in the country of Nigeria. They also saw Catholics killed in a Parish when suspected herdsmen stormed the Church and killed 18 persons, including two priests and left several were injured. Nigerian Bishops believe that terrorists and mercenaries have infiltrated the Fulani herdsmen to cause insecurity in the country. At a meeting with the Nigerian bishops he mentioned that he kept the country in prayer. “He said that we should be courageous particularly with regard to the recent troubles (and) with regard to terrorists that masquerade as herdsmen. (The Holy Father) told us to tell our people that he is with us in spirit and he is praying for us,” Archbishop Martins said.